Casa Frela Gallery has confirmed its role as a ground breaking new presence in the exhibition of Black and Latino autodidactic artists. Casa Frela Gallery’s latest offering, from the exclusive private collection of Thomas S. Schultz, M.D. is a perfect bridge that touches upon “outsider art” and it’s perennial connection to time, place and historical legacy. 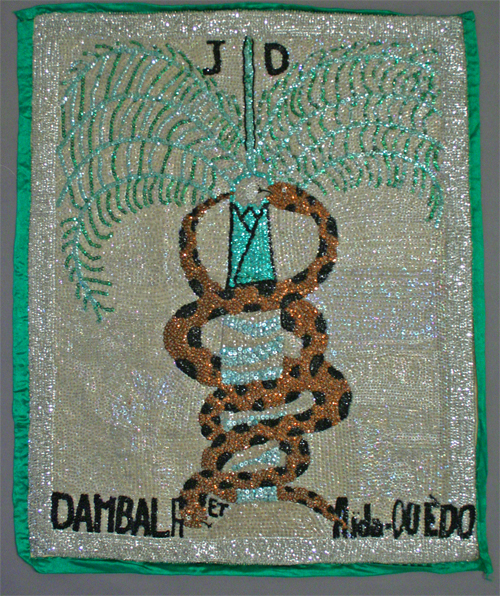 The 16 Vodou flags presented are handmade by Haitian folk artists. The collection spans the better-known loas, also known as spirits, in the Haitian religion of Vodou. Many of the flags presented in the exhibit are known to be over 150 years old. It makes the nature of this exhibit, precious and impressive. It is also known that some of these flags have been consecrated and used for actual ceremonial purposes, further heightening the worth of these capsules of time, religion and folklore. These period flags are the product of the syncretization of the Catholic religion and the native religion brought to Haiti by African slaves from West Africa most likely the Fon and Ewe tribes. They were able to use the Catholic saints to hide their African spirits in—there by marrying the two religions into one. By means of this unique textile art, African slaves were able to take the Catholic saints and match their attributes to their native deities. For example, Damballah was linked to Saint Patrick, because at the time Saint Patrick typically was depicted driving out the snakes from Ireland in Catholic lore. He is seen as the great “father serpent” equal to Damballah and thus the “great creator” and protector of the universe. All of the loa have their Catholic counterparts. The flags can also either demonstrate one of the two incarnations for each of the loa; they can allude to their rada or petro sides. The “cool” rada loa, are spirits which come from mother Africa and are benign in nature. Where as the petro form of the deity is the “hot” form, meaning that they are unbridled, violent forces to be reckoned with and that originate from the New World. The Haitian Vodou flags majestically drape with an iridescence of glinting color chrome, studded fabric, intricately detailed beading and sequin. These effigies are made by hand, requiring thousands of hours to create each one. The flags are heavy with richly hued with colors that bleed out in connection to Haiti’s past struggle for independence and it’s rich religious history—a history that inextricably can not be broken. With Haiti’s staked claim to independence as the first New World and Black colony to break from it’s colonial “mother country”—France. There at the formation of the first independent Black republic of the New World, it was a Vodou flag that was trouped proudly as a beacon to the to the Vodou deity Ezili Dantor she had become the fountain of great success for the independence and the formation of what we now know as Haiti. Dr. Schultz’s holdings of Haitian “outsider art”, in the vein of the Prinzhorn Collection include an important cross-section of first generation Haitian masters. In the segment of his collection that comprises the Haitian Vodou flags, Dr. Schultz continues to carry the torch that was begun as a collection by Mr. Virgil Young. Casa Frela Gallery invites the art world to participate in the rare and exclusive exposition of The Sacred Roots of Vintage Haitian Vodou Flags that these flags exalt and commemorate through their power and rare beauty. They are able to transcend on many levels multiple forms of art including ethnic, religious artifacts, autodidactic, outsider/naive art, to a unique historical glimpse of precious, long neglected primordial utilitarian art.